Illuminate large awnings and signs using a charming Warehouse Shade Gooseneck Light. Featuring all-aluminum construction, this 16" Warehouse Shade and arching gooseneck arm combo is durable with a rust resistant powder coated finish. 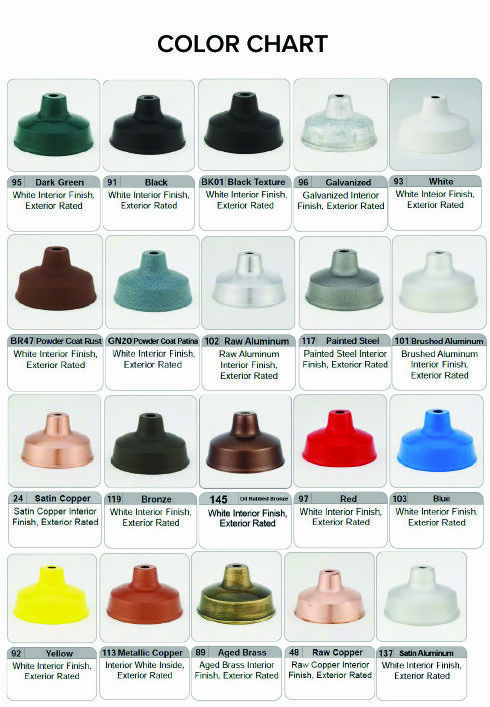 And to create commercial lighting fitted to your project, choose from 25 attractive color options. Standard warehouse gooseneck lights are wired for incandescent lamping and come with a wall mount aluminum back plate. Attach to any 4" standard box, flush mount or recessed. All parts of the gooseneck fixture are powder coated to match, with the inside of shades kept white for maximum luminosity. For non-standard goosenecks with compact fluorescent (CF), metal halide (MH), high pressure sodium (HPS) or LED lamping, please call for details. Mounting and ballast options may vary for HPS and MH gooseneck lighting. Also call too add industrial-inspired accessories like wire or cast guards and decorative globes.